Your smile creates an immediate, subconscious, visual impact on people you meet. A brighter smile gives the impression of youth, vitality, radiant health, happiness, and warmth. A bright smile is perceived as a healthy smile. Tooth whitening is an increasingly popular cosmetic dentistry procedure that can make a massive difference on the appearance of your smile. As we get older, our teeth naturally darken and discolor due to factors such as diet, age, lifestyle-smoking habits, drugs (like tetracycline), grinding (due to stress), trauma and even genetics. Tooth whitening can make your teeth look younger, cleaner and healthier. Extrinsic stains are those that appear on the surface of the teeth as a result of exposure to dark-colored beverages, foods and tobacco, and routine wear and tear. Superficial extrinsic stains are minor and can be removed by prophylactic dental cleaning and whitening. Intrinsic stains are those that form on the interior of teeth. Intrinsic stains result from trauma, aging, exposure to minerals (like tetracycline) during tooth formation and/or excessive ingestion of fluoride. There are alternative cosmetic solutions to treat intrinsic staining, such as dental veneers and crowns. Professional tooth whitening in a dental office is the preferred whitening method because it is more effective. Even though stronger agents are applied, the rest of the mouth, including the gums, is protected from these materials. The best whitening systems feature a buffer in the gel that protects the tooth enamel from damage, are extremely effective, and can transform teeth color in a single visit. Your teeth can literally brighten up to 5 shades in about an hour. Tooth whitening can last for 6 months or more, depending on how well you take care of your teeth. They can either be used as a primary whitening option or as secondary option after office whitening to maintain the whitening result for longer time. 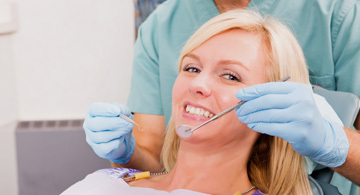 Dentist’s supervision is must before you start using Home tooth whitening methods. They include whitening strips, paint-on tooth gel, mouth trays with gel. These are typically safe products. Sensitivity: Bleaching can cause a temporary increase in sensitivity to temperature, pressure and touch. Whitening sensitivity lasts no longer than a day or two, but in some cases may persist up to a month. It is recommended to use desensitizing toothpaste for few days after a whitening session. Gum irritation: You might experience some degree of gum irritation resulting from the bleach concentration or from contact with the whitening trays. Such irritation typically lasts up to 1-2 days.